Murray Hill residents started a Facebook page called Third and 33rd (and Beyond) to discuss the homeless encampments in their neighborhoods and to post photos. NEW YORK CITY — Mayor Bill de Blasio said Thursday that heightened media coverage of the homeless in recent weeks is fueling the surge in 311 complaints since he's taken office. The mayor was responding to DNAinfo New York's exclusive report that the number of 311 calls about the homeless has jumped nearly 60 percent since he's taken office. He said recent stories claiming an increase in the number of homeless people on city streets are overstating the problem — but they are having an impact on the public. "I think the media has put a lot of attention on this issue lately, more than previously," he told reporters during a press conference at Lincoln Hospital in The Bronx. "I'm not sure if the attention that's been given is proportionate to what's happening. I think it's caused people to be more and more concerned." DNAinfo reported Thursday that between Jan. 1, 2015, and Aug. 9, 2015, the city's 311 system received 20,242 calls about a homeless person in need of assistance, in an emergency situation or living in an encampment. During that same time in 2013 — Mayor Michael Bloomberg's last year in office — 311 received 12,715 calls about the homeless. The city puts the current homeless shelter population at 56,000 after it reached a record high of 59,000 in December 2014. There were about 3,100 street homeless individuals according to the last count but advocates believe that number is low. De Blasio defended his administration's response to the city's homeless problem, saying he plans to spend $1 billion on homelessness and has already introduced mental health initiatives such as NYC Safe. "We are taking some very serious steps and we've made some very big investments to address the problem," de Blasio said. The city is also changing how its agencies deals with mental illness, an effort being led by First Lady Chirlane McCray that is scheduled to be revealed in the fall. 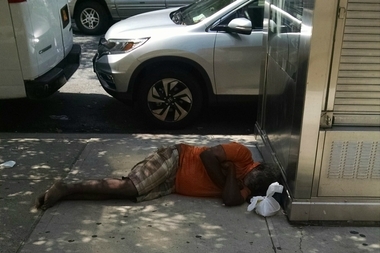 "We need to recognize for decades there have been folks who are homeless," de Blasio said. "The vast majority of them are law abiding. The vast majority of them don't bother anyone. We have to help them to a better life. We have to get them the mental health services and the drug treatment they need or to housing," he added. Evan Thies, a political consultant and president of Brooklyn Strategies, said that while media coverage of homelessness has increased recently, the mayor can't ignore the fact that there has also been a jump in homelessness during his term. City residents now have cellphones to connect with 311 more easily and may not be accustomed to seeing the current volume of homeless on the streets. "At the turn of the century, large numbers of homeless was still part of the landscape of New York City," Thies said. Either way, it's a copout for de Blasio to blame media coverage for New Yorkers recognizing a change in homelessness, he added. "The mayor should thank New Yorkers for bringing this issue to his attention," Thies said. "People are reporting homelessness because they are actually concerned and they want to see these individuals get some attention."